I love God’s timing! It amazes me the things that only He can orchestrate. When you answer the call to follow Jesus, you just never know where you may end up. Following Jesus is definitely not boring! During the Wednesday evening service this week, my pastor talked about how when God calls you, He will most likely call you to a place that is out of your comfort zone. God will never call you to mediocrity. If God called you to something that was easy for you, then you wouldn’t need Him, or have to rely on Him. Hmm… Interesting. Hold on to that thought. I just finished reading the book Move Toward the Mess: The Ultimate Fix for a Boring Christian Life (David C. Cook 2016) by John Hambrick. Little did I know that the timing this book would correspond with a day I won’t soon forget. Last fall, my Ladies Bible Study group wanted to do some kind of service project together. Today was our appointed day to volunteer at a local soup kitchen by the name of Fishes and Loaves. This soup kitchen feeds 200-400 hungry people in downtown Houston six days a week. 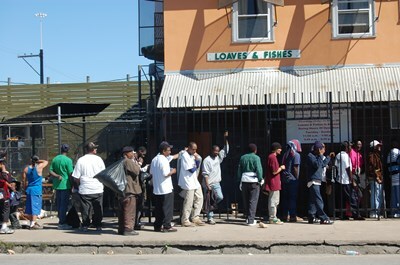 As we pulled up to the to the building, there is already a huge line of people waiting to be fed. For some of these people, this may be the only meal that they eat today. It is a cold day here in Houston, and the temperatures are in the 40’s and 50’s, and it is damp and overcast. Most of the men and women we served, live under the bridge near the kitchen on the east side of downtown Houston. Our group today consisted of mostly men, and a few women. The people thanked us and said God bless you for serving food to us. However, one woman in particular caught my attention, and it struck a cord with me. She came in with a black eye, and I wondered what she endured to get her to this place. Life on the streets is messy. The Houston food bank along with other generous sponsors help provide the food. Our family donates money to the Houston Food bank every year, but today I locked eyes with the hungry men and women of Houston and I will never be the same. Magnificat Houses is the umbrella organization over Fishes and Loaves that serves some one the neediest people in the inner city of Houston. It has been serving the mentally ill, homeless and disadvantaged since 1968. Magnificat house provides hope, food, shelter, half-way houses and rehabilitative services to people in the Houston area. It is completly led by volunteers, and operates by donation. Visit Magnificat Houses to learn more about this incredible organization. Julie Batsche at Fishes and Loaves was our tour guide for the day. Our group served along side some of the most joy filled people that I have ever seen, their countannce radiates Jesus! We began with a tour of the facility, the chaplin shared the history of the organization, and we started with prayer. Today we served fresh salad, and gumbo made by Cedrick Broussard the cook, and his assistant, along with a roll, crackers and dessert to 205 people. 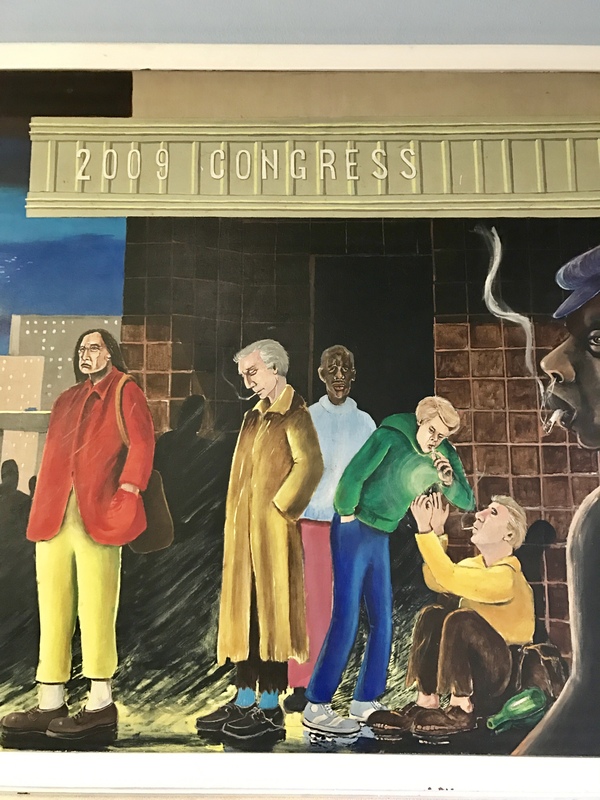 The murals on the wall were painted by one of the homeless men who used to come the shelter many years ago. 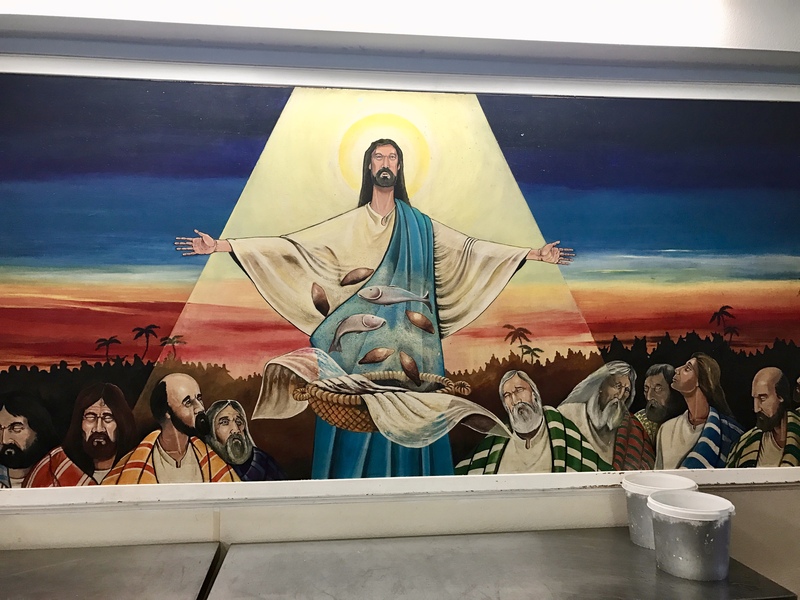 Below is a depiction of the miracle of the fishes and loaves from the gospels that the kitchen is named after. The workers here today see this miracle played out before their very own eyes, because God provides daily for Loaves and Fishes to feed the hungry. Our world is full of lost and hurting people who desperately need to know the love of Christ. 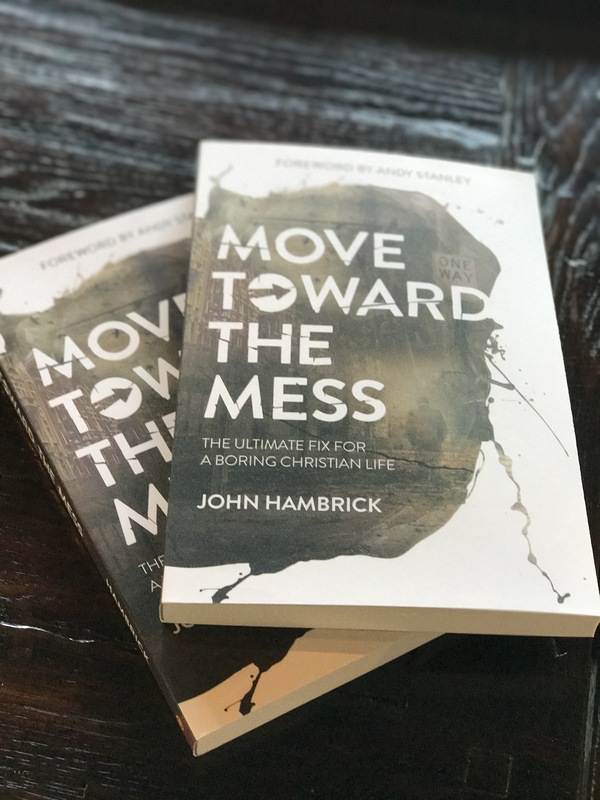 In Move Toward the Mess, John Hambrick challenges American Christians who are bored sitting in the pews each Sunday, to get up and follow Jesus into the mess to minister to the lost and hurting in the world. I found this book to be both challenging and exciting. In the first part of the book, John provides several examples of people that live their lives right smack in the middle of the mess, and in the second half of the book, he outlines practical ways for us to move toward the mess. There is a nice flow from chapter to chapter, and each chapter ends with thought-provoking questions that would make this an excellent book for individual study or small group discussion. Move toward the mess is a love story. It is the ultimate love story of a mighty Savior who came to earth to bind up the brokenhearted, wipe every tear away, save the lost, and lavish his amazing grace on us. There are lots of different ways to move toward the mess. Last Spring when our community experienced devasting flooding we mobilized hundreds of church members into the community to help flood victims. You can read about how we moved toward the mess in The Church Has Left the Building. It is time for the church to leave the building, and move toward the mess. I love the message of this book, and would love its message to go viral! Share this post on social media for a chance to win your very own copy of Move Toward the Mess between now and January 15th! John Hambrick is no stranger to the mess. He is the Director of Starting Point and Staff Development at Buckhead Church in Atlanta, GA – one of the North Point Community Church campuses in Atlanta that bestselling author Andy Stanley founded. John has served in other churches as an associate pastor and pastor. He has also been a staff member for Young Life and was one of the chaplains at Kings College, University of London. John and his wife, Patty, have two children and reside in Atlanta, Georgia. A special thank you to The Blog About Network, The Blythe Daniel Agency and publishers for providing a copy of this book for review and one to giveaway. Misty,that was amazing! I’ll certainly check out that book. God calls us out of our comfort zone and into the thick of things. That certainly resonates with my own life…into the mess! “The Church has left the building” – yes, we have, and we’re taking Jesus with us everywhere we go! It is exciting to watch God move in our world through our tiny little lives simply because we want Him more than anything, and He’s the One who put the want there in the first place. 🙂 This was very inspiring, thank you. You are so right Misty, we need to move out of our comfort zone and into the mess to minister. It’s a lovely thing that you do! Ohhh…. I NEED to read this book! Thanks for sharing! I finished it yesterday! And it was AMAZING! So glad I stumbled upon your post! Thanks for sharing!! Congratulations Jennifer Gilmore! You are the lucky winner of the book Move Toward the Mess! May God bless you as you #MoveTowardTheMess! Thank you for highlighting another great resource out there encouraging us to love outside the walls of our churches. The past few years I really have been dedicating my attention to making myself available to see what God is doing when I am out an about. I’ve really been listening to hear what He is saying. It really has been life changing and quite the adventure to partner with Him in bringing His kindness to many in unique ways. I will have to add this book to my list!